Have you noticed that invariably the book that you think is the dumbest thing on earth is the one that a child cannot stop asking for? 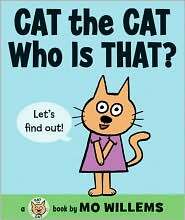 I read Cat the Cat Who is That? through once to Ella and planned to return it immediately to the library. She, however, had different plans. She kept pulling it out of the library basket and we probably read it a dozen or more times before it was time to take it back. Someday, Mo Willems, I will stop underestimating the way children take to your books. The illustrations are, like most of Willems’ books, something you could draw yourself in five minutes. And the text? Well, you could write that in two minutes. Cat the Cat keeps meeting up with a new friend and introducing them, “It’s Mouse the Mouse! Hi, Mouse the Mouse.” And then there is an unexpected alien/blob/weird thing. And she has no idea who it is. (Of course they become friends. How sweet). Clearly, despite my skepticism, it was a hit. When I read Ella the Pigeon books, her mind is going to be blown. Disappearing Desmond is a little more advanced than Cat the Cat, but still something Ella could easily sit through (in fact, we read it twice through the first day at her request). I’ve noticed that none of the books so far are too hard or long for her attention span, so when it says ages 2 through 2nd grade, I’m inclined to think that it means a 2 year old could listen to any of them and a 2nd grader could read pretty much any of them. Desmond is painfully shy and finds places to hide no matter where he is (if Ella was a little older, I think she’d enjoy trying to spot him in each picture). And then, as so often happens in picture books, someone new arrives at school and notices him and after a while Desmond finds he likes being visible. And then he starts noticing other kids who are hiding in plain sight too. And so the circle of life continues. This one reminded me of Kevin Henkes’ mouse books in the best way. Definitely a fun little read. I wasn't that impressed by Cat the Cat either, but something about it must have clicked with Scott. It was the first book he read by himself. It was just easy enough when he was discouraged, but just entertaining enough to motivate him to get to the funny ending. So for an early reader, it wins my vote. I have to admit it doesn't make a great read aloud for an adult though. That being said, some of Mo Willems' other books I LOVE!!! I like the Pigeon books, but there are others I love more. "Leonardo the Terrible Monster" and "Edwina, the Dinosaur That Didn't Know She Was Extinct" and "Naked Mole Rat Gets Dressed" are totally worth checking out if you haven't. Not like his other more simplistic story lines. My two year old daughter LOVES Cat the Cat. Every time we go to the library, she wants Cat the Cat. I just keep checking out the same three books. She also loves the Elephant and Pig that Mo Willems does. 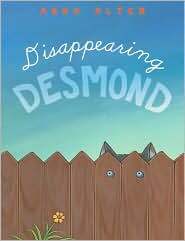 Thanks for the review of the Disappearing Desmond. I will have to check that out for my daughter. They always adore the ones that aren't your favorite, it seems. But as long as they like books, ah well. Just like how T LOVES Skippy Jon Jones, and I, um, do not.